Finding domestic help in Kharghar has been an endless nightmare and I finally decided to end the trauma and get myself a dishwasher. It's another matter that I ended up rebuilding the kitchen to accommodate it but at the end of the day, I'm glad I did. Choosing a dishwasher should be simple. You walk into a shop, ask to see the dishwashers they have available, get a thorough walk through of the functions and options on a couple of short listed models, and finally pick one to be delivered home. The reality is nothing remotely close. We went to Croma, Aarcee, and a couple of other shops only to find that they rarely even have a dishwasher on display. And if they do, don't expect them to have a clue about how it works. Granted dishwashers aren't selling like air conditioners and washing machines for laundry but if these shops made a better effort I'm sure they would. The problem with buying online was two-fold. I didn't feel confident that I would have someone to turn to for any after sales issues, and secondly, how would I know which machine is out of date and what's the new one in the market. Eventually, I asked on Facebook and I got a lot of genuine advice and useful information. I discovered that IFB has its own stores called IFB Point and there was one nearby, in Nerul. We went there to see if we could get a dishwasher that suited our needs and budget. What I liked best was how well informed the sales lady was. She knew the machine inside out, was able to answer every question that we had, and gave us a lot of sensible and practical information instead of a scripted sales pitch. This is where we discovered that a model we shortlisted earlier (having seen it online) had been discontinued by the company. We finalised the IFB Neptune VX and placed our order. We paid INR 34,200 for it. Delivery was as prompt as promised and the machine arrived within 48 hours after payment. Installation took a little longer, to an extent delayed by the incessant rains in Mumbai at the start of the monsoons. Once the technician arrived and opened the packing we discovered that the machine was damaged, there was a big, deep crack on the top. The technician pointed it out to me, apologised for the damaged piece and said it would be replaced immediately. I waited for a couple of days but there was no sign of the replacement. Finally the hubby called the showroom to enquire. Much to our surprise the showroom had no idea about the damaged machine or the replacement! However they assured us that the replacement would arrive within 24 hours, and it did. I expected that it would get installed within a day or so but that was not to be. Another few days passed and finally I went back to the showroom and asked what was going on. Frustrated with the lack of coordination between the showroom staff and their technical crew I said if it was not installed and functioning by the end of the next day I would personally bring the machine and leave it at their premises and they could refund my money. Anyway, a technician arrived the following day and we finally had the machine installed. I had to call a plumber to install a different tap of a certain specification so that the dishwasher could be installed. It would have been a far easier experience if the company made sure that the technician had the requisite skills to change basic plumbing fittings OR if the company informed customers in advance that specific plumbing is required. After installation the technician gave me a demo. He wasn't prepared to answer any questions and only wanted to recite his scripted run through of the functions and how tos. It's about a month since the dishwasher is here and I can only say I am very happy to have it. Like most people my first concern was with the oily vessels or those which had burned bits of food stuck in them. As with hand washing, I let the vessels soak for a while and then put them in the dishwasher. The results were quite impressive and in the case of one of my heavy bottomed frying pans I could see the original colour of the pan again! Glassware comes out sparkling and if you have stubborn gummy patches on bottles from labels, the hot water and steam in the dishwasher takes care of it all. Ceramics and china also get squeaky clean. I've seen an occasional food particle still on a plate or bowl but all it took was a rinse under the tap and it was gone. Not a big deal at all. The machine cleans stainless steel very well, the hot water certainly seems to help the vessels come out really clean. There's no white film like you see from washing powders and cakes. Though I have washed many of my wooden spoons and spatulas in the machine I won't do it frequently. I don't think the hot water and intensive cleaning is good for the wood. Heavy vessels like pressure cookers, woks, frying pans etc fare very well in the dishwasher - no grease, no patches of food particles stuck to the sides, and of course, everything is cleaned inside and outside. No more reminding the maid to wash under plates, outside the pans, clean the handles, etc. Do I recommend that you buy a dishwasher? Yes I do. Do I recommend the IFB Neptune VX? I certainly do. In spite of the hiccups while installing, the machine has turned out to be a blessing and I am cooking more because I don't have to worry about piles of dirty dishes in the sink. Nice to know a detailed review on dish washers in India.. I always wondered if they would clean our greasy pots and pans.. The only problem now for me would be space .. The kitchens and apartments in Mumbai are so tiny.. Anyways I will see when I come back to live in Mumbai while renovating the apartment if I can find space and get one. I doubt if dishwashers, the machine kind, will catch on fast in India. With bai's readily available I guess it will take a while for people to get over their concerns about the cleanliness factor, but when they do I guess it will be as ubiquitous as the laundry washng machines! It has been rarely observed that a person goes to buy a dishwasher in malls or other shopping complex, but you can still try it out with Croma lower parel. 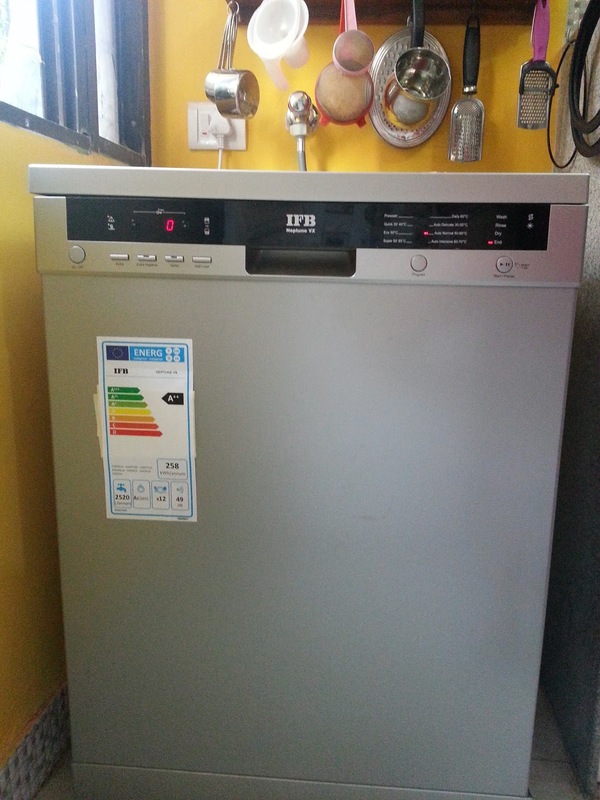 There is a possibility you may find "The IFB Neptune VX Dishwasher" their.